The pistols are the cheapest guns in the game. They are a player's secondary weapon, and usually are only used in pistol-only rounds; at the start of the game when nobody can afford larger guns; or when ammunition supplies for the larger guns have been exhausted. They are only semi-automatic, and typically lack power, but can be quite effective if aimed carefully. The Glock is low-powered, but accurate. It is the default terrorist starting pistol, and is dirt cheap, but is often not particularly useful unless you are very accurate. If you have a fast finger, buy this gun or join the terrorist team for a free gun. In some versions, this has an unlimited fire rate. If your finger is not so fast, use bursts and go for headshots. 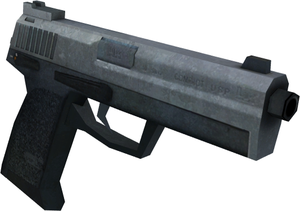 The USP is the default counter-terrorist starting pistol, packing a greater firepower into a similar size and weight. The added advantage of being able to silence the USP means that counter-terrorists often have an advantage in pistol rounds (i.e. at the start of a new game when nobody's got any money), though it makes the crosshair wider, imparing accuracy when firing multiple shots. The P228 is a small pistol, with average attributes. Many players choose the Desert Eagle over it, as the prices are quite similar, but the P228 is a decent choice if you need a pistol. Its accuracy is around average, but it is more powerful than the USP. The P228 has a higher rate of fire than the Desert Eagle, a larger magazine, and it only takes about five shots to the chest to kill a target. 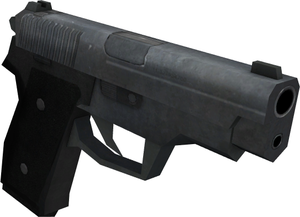 You can't snipe with this like you can the Desert Eagle though, and like all other pistols it does not penetrate walls. Learn to use the strong recoil of the gun to increase your ability to hit a target and increase the chances of getting a head shot (it deals over 100 damage to the face). It may have a faster firing rate than other pistols, but its unexceptional middlingness make it mostly a curiosity or a niche gun. Note: The P228 is only chambered in 9x19mm and appears to be a P229 which is offered in .357 SIG. The Desert Eagle.50 AE (or "Deagle") is the most powerful pistol, being able to kill somebody with one headshot. Its magazine is rather small (only 7 rounds), so accuracy when using it is quite important. Most players will choose a Desert Eagle.50 AE if they're buying a handgun (and have the money). If you crouch and pick your shots you can snipe with this pistol and get headshots from ranges that most people will think they're safe during pistol rounds. The bullets also penetrate players and walls, which despite its magazine size, can make this gun shine in close quarters and in forcing foes out of hiding. It is by far the most versatile pistol and probably the best buy in the game, dollar for effectiveness, which is why it's the most popular handgun for advanced players. The FN Five-seveN has high accuracy and a large magazine, but is lacking in power. Its very low weight does not affect the running speed with the pistol, as all pistols allow the player to run at the same speed (250 units per second). Good weapon if used correctly, but with this gun the trick is to stay away from close range fights (except if you are sure you can get 2-3 shots to the head). Compared to the dual Berettas, it's weaker and has a lower rate of fire, but better accuracy and low recoil compared to other pistols. Perhaps a good companion gun to a shotgun or close-in primary weapon. The Berettas are not particularly useful apart from the fact that there are two of them, which doubles the firing rate over a single pistol. They have poor accuracy, and only average power, so are best used as spray weapons (and with considerable success in some cases). However, due to their high price and poor attributes, it's best to go for a cheaper pistol, or a sub-machine gun instead, unless you practice a lot with them, in which case they can actually perform better than many SMGs. Their long reloading time is also a significant weakness. Practice makes perfect. Once you become proficient with these you become a very formidable force. You can also buy these during the first round of a new map, which will give you a significant advantage in terms of magazine size. Headshots are key with this gun. The sub-machine guns are the next cheapest, and pack more firepower than the pistols. Many players prefer to use SMGs over full-blown rifles due to the weight advantage (SMGs weigh less, and therefore the player can move faster) and the fact that if they're aimed properly, they can kill just as effectively and quickly as a rifle or shotgun. 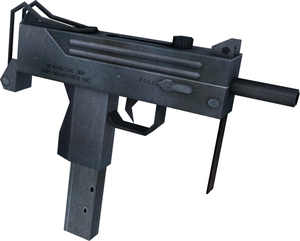 The MAC10 is similar in many respects to the TMP. However, its rate of fire is slower, and its power is greater. You can use the MAC10 in a similar fashion to the TMP, and it copes well at close range, but since its accuracy is appalling, you can't effectively snipe or fire long-distance with one. The TMP (or "Schmidt Machine Pistol") is the cheapest counter-terrorist sub-machine gun, but is very useful if wielded correctly. It may not be particularly powerful, but its rate of fire is almost unmatcheable, and is thus an exceedingly effective spray gun, especially in confined spaces. If aimed properly, and fired at the right time, one player can take down most of an enemy team with headshots, using only a TMP. It's also permanently silenced. 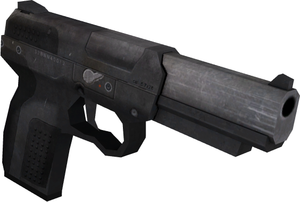 The MP5 navy has a high rate of fire, good accuracy, and decent power. This is the most common submachinegun, as it has small recoil and the crosshair is the same while running, walking or ducking. If you aim for the head, you can pull off consistent headshots typically before the other person has time to react. The accuracy is decent at longer ranges, and even at mid-range a full-auto spray can be effective in bringing down an enemy at full health, although it may exhaust the magazine. 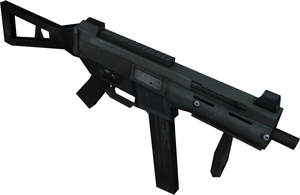 The UMP is similar in many respects to the MP5 navy, but has a slower rate of fire. It is a slightly more powerful weapon, and is somewhat lighter, but the slower rate of fire means that you can't pull off the "surprise kills" you can with the MP5 navy. It may also have a slightly higher recoil than the MP5. Its slight increase in power is not enough to offset its low fire rate, higher cost, and smaller magazine for most players, but you could do worse for primary weapons. The P90 is the ultimate sub-machine gun. It has a massive rate of fire, with OK accuracy, relatively little recoil, and lower power, meaning that it's best used as a spray weapon. 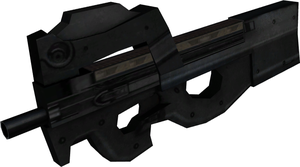 The large magazine (largest in game excluding the M249) lends itself to this, and so the P90 should always be used to spray at people's heads. The shotguns are a special group of weapons. Most players can either use shotguns properly, or they can't. Correct use of a shotgun entails precise timing (not necessarily good aim) about when to shoot, especially with the pump-action M3 super 90, as mis-timing of a shot can mean death due to pumping time. Reload sooner as opposed to later. With the shotguns each round is reloaded individually, and you can fire to interrupt the reload. The M3 Super 90 is an incredibly powerful weapon, but has a long pump and reload time. One shot to the head or even a close shot to the body, with most or all of the BBs connecting, will be fatal, but mis-timing the shot will mean you have to evade their fire until you've pumped for the next shot. The M3 Super 90 works considerably better at close range, but some people have been known to snipe with one. In either case the BBs the gun puts out always have the off chance of striking a foe in the head, doing near-fatal damage each. For the price, this is one of the best buys in the game, but only in the hands of someone who knows how to use it. It can be something of an equalizer against a better-financed team when money is tight. In a panicked close-range fight it can sustain its low rate of fire for a long time and a reduced rate of fire after that. The XM1014 is an auto-shotgun, meaning it doesn't have the pump time of the M3 super 90. It allows you to fire off all 7 rounds in two seconds or less, and can be effective against a mass of enemies. However, it is somewhat less powerful than the M3 Super 90, so at least two and often more shots will be required to kill somebody. It is also almost double the price of the M3 Super 90 and considerably heavier. For the CTs, $100 more will buy the far more versatile M4 Carbine. 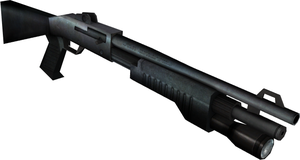 Probably the single worst buy in the game for the price, this shotgun, though often scorned by those killed by it as a "noob cannon", "noob stick", "noob shotty", is actually not that effective in almost anyone's hands. This is pretty obvious, but the bots' behavior is quite strange, since they shoot, load, shoot, load, etc. This increases the accuracy of the gun by taking out the recoil, so do that if you are stuck with a group of people, with no where to run. At least you won't waste any ammunition if you die. The rifles are the most powerful automatic weapons, and the most commonly-used. 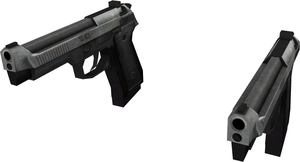 Players need a fair amount of money to be able to buy one, and they therefore typically only appear during the second round of a game, after pistols have been used in the first round. Due to the firepower of any of these rifles, aim is not a requirement of use, but their effectiveness can increase dramatically if the seconds are taken to crouch down and aim for a player's head. Doing so will mean two or three shots are fired instead of ten. 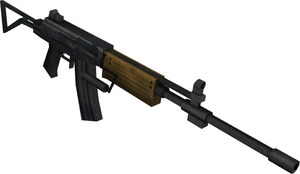 The Galil has a high rate of fire, and decent accuracy, but terrible recoil and relatively little power. It is what you have as a cheap rifle, and its 35-shot magazine offers a lot of potential damage overall but because of its statistics it is a gun at war with itself: it cannot be an effective sniper because of its low damage nor is it a great short-range gun despite its high fire rate, because of its high recoil. It does a decent job at short to medium range but excels at nothing. Either spray full auto and hope your target gets unlucky and catches a bullet in the face while running or try to land solid chest shots in bursts. One thing it might be good at is spraying through walls at close range when you suspect an enemy, since like all rifles, the Para, and the Desert Eagle, it can pierce walls and objects, and its large magazine makes it better equipped than most for sustained fire. If you do rely on spraying this is the one gun that is probably in most danger of running out of ammo, because you still get the standard 120 rounds total. The FAMAS is a decent weapon compared to some other rifles and SMGs. It has an Slowish fire rate of 675RPM when firing full auto, but it is very accurate however,not very powerful. It has a burst fire mode which has shoots much quicker at 1100RPM, and it is useful for ammo conservation or when you have a very itchy trigger finger. This gun excels at long range, it gives a skilled user the ability to easily pull of single shot headshots, its effectiveness at close range is only limited by its low magazine capacity. Always use burst mode for long-range combat and aim for the head or the upper body. A couple burst shots will definitely kill, since the burst firing mode will make the weapon way more accurate compared to shooting manual bursts in the automatic mode. The AK47 is one of the classic weapons included in every game. 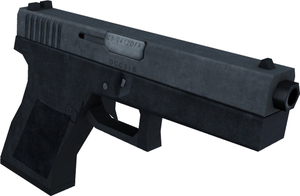 It is powerful, has a high rate of fire, and good accuracy if fired in small bursts. Most terrorists will use the AK47 almost exclusively, and it's a safe bet for any player on any map. Remember to fire in small bursts only, as in longer bursts, all the accuracy is lost and you will most likely miss your target by a long way. This weapon will kill anyone with a single headshot, no matter if they wear a helmet or not. The M4A1 is the counter-terrorists' equivalent of the AK47. It is powerful, has a rapid rate of fire, and is slightly more accurate than the AK47, especially when only a few shots at a time are fired. It is a capable weapon in the hands of any player, and most counter-terrorists will use it if they have the money available. If you crouch when firing with the M4A1, headshots are very easy to achieve, and you will kill with one headshot, unless the opponent is smart enough to wear a helmet. Many people find it easier with a silencer in certain conditions. For example, when facing a large group of enemies at the double-doors in de_aztec. If you are sure you can kill them, since they don't have good accuracy, put on the silencer and start spraying at their lower bodies. The recoil should bring up the attack box, shooting their chests, or possibly even their heads. Also, reload after you have about five bullets left: if your foes charge, you can quickly switch to a secondary and then back to the M4 to empty your magazine at them. As always, attaching the silencer reduces damage and recoil. The SG-552 is a more expensive weapon (which raises the question of why the terrorists can purchase it). It is about as powerful as the M4A1 and with a similar firerate, but includes the addition of an ACOG scope, enabling both sniping and assault tactics to be used. It is a very good all-round weapon, but many players can't buy it due to its high price. To snipe, zoom in on the enemy, and shoot one shot at a time. It actually seems more accurate than the AUG or the counter-terrorist version. In at most six accurate shots, you can kill someone from medium/long range. However, you should only use the scope at long-range, as the rate of fire falls dramatically when scoping. 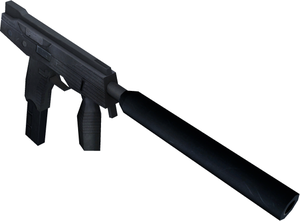 The AUG is the counter-terrorist equivalent to the SG-552. It also has a scope, and is about as powerful as the SG-552. However, it is considerably heavier, and therefore will impede movement more than the other weapons. Despite this, it is a very good weapon both for assault and sniping, and it's only the high price which prevents many players from using it. There is only one machine gun: the M249-SAW. It is one of the most expensive weapons, but also has one of the highest firing rates, and can be used very effectively as a spray gun. Contrary to popular belief, the machine gun is actually quite accurate when firing one round at a time, and can be used to snipe in a similar manner as a rifle. The M249-SAW is a very expensive weapon, with a high rate of fire and a 100-round belt. Each round does not inflict a particularly high amount of damage, and it isn't particularly accurate unless fired in single shots or short bursts, but the spray power from an M249 is almost unbeatable. Due to the fact it carries a large ammunition bin, the advised way of using an M249 is to shoot anything that is vaguely out of the ordinary. Shoot round corners as you jump round them. Shoot at anything that moves. Although the M249 is not as good for personal defense as an SMG, a shotgun, or an AR, you can still use it to fend for yourself. The recoil prevents you from taking precision shots, so aim center mass, and hopefully the recoil will lift your bullet hose to their head and take them down quickly. Keep in mind that SMGs and Rifles are more accurate and deadly, however they also have lower capacity. You can take down as many as 7 people without reloading your M249, so it is best used for flanking because it isn't as deadly head on as the other weapons. You can use this in a closed space, like cs_office, or a large place, like de_aztec. For close spaces, shoot at every corner, and for large spaces, when you are being shot at, keep your finger on the trigger and search for the enemy. When you see some red blood, keep it there and either: spray (if it is close-range) or burst (in either situation, preferably long-range). Also, for both situations, use it for covering or supressing fire when facing the group (or person, please do it in group-vs-group), aka shooting at the group without bursting. The new players would retreat, and the pros would stay, leaving your team to kill the pros, unless they are smart enough to retreat once their whole team retreats or everyone besides the pro died. 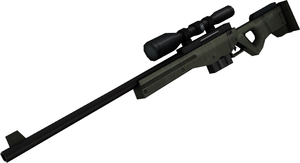 This weapon is somewhat like the AWP with the scout; it is expensive, and it is sort of hard to use effectively. 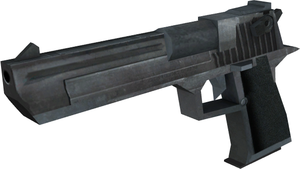 People also say this weapon is a stupid person's weapon, and pros don't use this, but that is false. If you can kill three people using this with a expert level (bots), then you are a pro. Otherwise, keep practicing. The sniper rifles are the most specialised weapons available. They are all either non-automatic, or semi-automatic, and designed for careful aiming over long distances. They all boast telescopic sights, and several of them (namely the AWP and the automatic sniper rifles) are banned on many servers due to their extreme firepower. Before using a sniper rifle on the internet, it is advisable to practice carefully with bots locally, as it takes skill to wield a sniper rifle well. When buying a sniper, it is always a good idea to buy a good pistol as well, since snipers are extremely poor in close-range combat (since they don't have crosshairs unless zoomed, and zooming in at close-range is not advised). 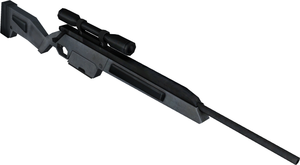 The scout is the cheapest sniper rifle, but does the least damage, taking two body shots or one shot to the head to kill somebody, and is bolt action, meaning the gun must be cocked after every shot, taking time. 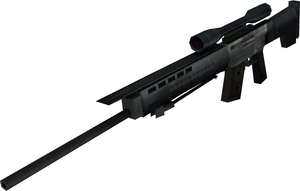 The scout is the most accurate sniper rifle, and is very light, allowing for fast running speeds. The accuracy of the scout is such that it will still be moderately accurate while strafing, unlike the AWP. If you are inaccurate don't use the scout, because if you are unable to hit people in the head you will be very ineffective with the scout. If you aren't very accurate, use the automatic sniper rifles instead, as they give you more opportunity to take repeat shots. Also, the scout is widely believed to be a pro gun, so if you are good with it that's great, but beware that it is known as a pro weapon because it is very difficult to use effectively. 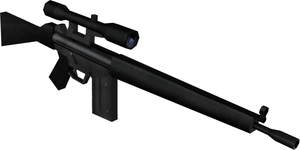 Along with the SG-550, the G3/SG-1 is an auto-sniper, and as such is banned on many servers. When sniping with the G3/SG-1, it is important not to get carried away with the fact that this gun is an auto-sniper: each consecutive automatic shot is considerably less accurate than the last, and going overboard with rapid fire will quickly empty the twenty-round magazine. 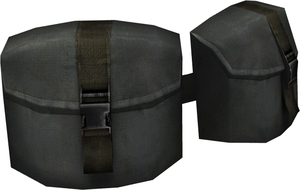 It is a powerful weapon, and its shots can go through walls and boxes, normally killing with two shots. As with the G3/SG-1, the SG-550 is an auto-sniper, and banned on many servers. The SG-550 is less powerful than the G3/SG-1, but fires faster and is $800 cheaper. Its accuracy falls dramatically with each consecutive automatic shot, so it's best to fire one or perhaps two shots at a time, then pause and re-aim. Use it when you are playing with beginner bots. Act like it is a real sniper rifle, and shoot and wait for the bolt-action substitution. The beginners are fairly stupid, and will usually shoot above the head, hoping for a head-shot. This is practice for using a scout for real tournaments, as the "auto-snipers" are a disgrace to most servers and, as listed above, will be banned. If you are up to the challenge, play against "professional" bots. Also, if you can, change the settings to (possibly) sniper rifles only. This will help you get better with killing other snipers. The AWP is the largest and most powerful sniper rifle, killing in one shot in most cases (in the case of a direct, unobstructed shot, only being hit in the leg is survivable). It is banned on many servers, but if you are allowed to use it, make good use of the scope. The AWP's scope is very detailed, and proficient snipers can jump out from behind cover, zoom in, fire and kill somebody then hide again multiple times and not get hurt. Training for hours offline with bots or online in deathmatch servers is the best way to go about learning. The drawback of this gun is that it isn't very accurate while moving, you have to actually stop moving and fire for the bullet to hit the target. Also, beware that this gun is sometimes believed to be a cheap gun because of its very high power and overusing it is discouraged in public servers. However unknown to others is the fact that this gun can be defeated. Using zig-zagging and unpredictable movement an awper can be taken down. This takes a bit of practice but can be achieved. To chamber a new round faster than would otherwise be possible, you can change to a pistol, then back to the AWP very quickly. If practiced enough, this will result in a faster chamber time. This weapon is almost exclusively known as the AWP (Arctic Warfare Police), but is actually intended to be the AWM (Arctic Warfare Magnum). These weapons can be thrown, and are irretrievable once thrown. Skilled players will bounce them off walls so that they land around corners; this is especially useful with flashbang grenades, which you don't want to look at once they've been thrown. Every grenade makes at least one damage if you manage to hit your enemy with it, so there is a possibility to kill an enemy with a flashbang or a smoke. The flashbang grenade is a good cheap way to keep the enemy from hitting you. When it goes off, any players (even your teammates) looking at it – or a reflective surface showing it – will be blinded for several seconds. Any players in the close vicinity will also be completely blinded and deafened. When thrown ahead of a rushing force, a flashbang is invaluable; one method of using it is to stop just before a corner, and bounce one off a wall to go off around the corner before you jump round. Even if the flash didn't affect them, chances are enemies had to take cover and are less likely to be in a proper firing position right away. Flashbangs can also make a good distraction if you need to retreat. Counter-tactic: If you see one land in front of you, you have several options. First, if no cover is available, quickly turn 180° directly opposite of the flashbang. This will minimize the effect to where you can still make out the area. The second is to open fire in the general direction the grenade came from hoping the enemy will be discouraged to go through with their attack. Thirdly, you can throw your own flashbang near yourself, or if possible, at the expected direction of your attacker. While you will be blinded again, there's some chance an attacker charging you will also be rendered blind. 1: Concealing your own team's movements when you're moving out of cover. 2: Enveloping your enemies in a smoke cloud, which disorients and blinds them while allowing your team free movement around the area, and if their cover is penetrable or limited, the smoke cloud can be sprayed at with little hope of retaliation. This often works well in conjunction with flashbangs to completely disorient your opponents. 3: In the case of a defensive position; for example, stopping attackers coming through double doors (a narrow but bullet-penetrable choke point), a smoke on the point of entry makes it difficult for enemies to coordinate their exit (they may block each other accidentally because they can't see each other) and prevents their retaliation. This is really effective in conjunction with a machine gun, or with silenced weapons (especially the M4) which do not have muzzle flashes, which are visible through smoke. 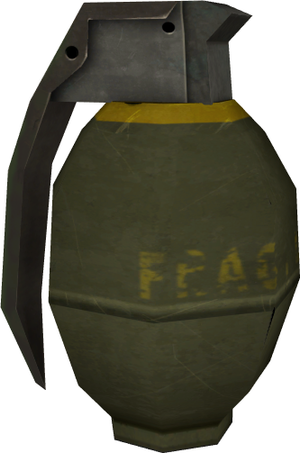 A high-explosive grenade (or frag grenade) explodes a few seconds after being thrown, hurting or killing any players (Even your teammates, unless friendly fire is turned off. Even if it is, your own grenades still hurt you) near it; the damage given depends on how far away from the grenade you are. Grenades are useful to throw when you know somebody is (for example) around a corner, but jumping out to shoot them would be too risky: they're bedded in, and your accuracy would be thrown by the movement. Also, HE grenades have the same deafening effect as flashbangs do (but unlike flashbangs this effect only applies to people who take damage from the grenade, so if FF is turned off your teammates won't be deafened by a grenade you throw). Other weapons are: explosives, not actually weapons, or gametype-specific, and can't be categorised with the others. 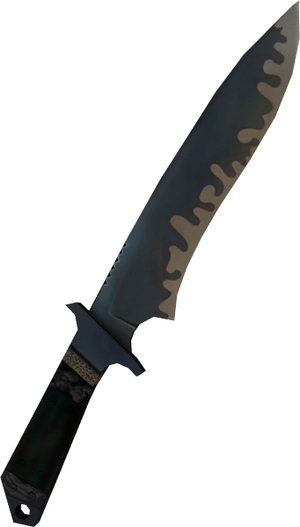 The knife is given to all players automatically at the start of each round, cannot be dropped, and doesn't cost a thing. It is the least effective weapon, but - since it requires no ammunition - can be used again and again. Players are able to run faster with the knife equipped than with any primary weapon other than lighter submachine guns and the Schmidt Scout, and for this reason it is often used for rushing. It is one of the ultimate humiliations to be knifed to death in Counter-Strike: Source. The knife has a primary and secondary attack. Primary attack will knife faster, but does less damage (about 12 damage). Secondary attack is about twice as slow as the primary, but does 55 damage in every attack, so two attacks is a confirmed kill. If you knife the enemy from the back with this attack, it will instantly kill the enemy, no matter the amount of hitpoints or armour. Players tend to throw HE-grenades at the target and then use the knife for a faster and safer kill. The range of the primary attack is a bit higher, giving you a small advantage in knife fights if you want to avoid getting hit by the secondary attack. However, if you are not a pro with the knife, don't even think about it. Kevlar is an invaluable asset to have once the first few rounds have been completed, as it adds an extra layer of protection, and reduces the damage caused by enemy fire. It does not, however, make you invulnerable. Purchasing kevlar and a helmet is more expensive than buying just kevlar, but provides better protection, especially when playing against players who fire consistent headshots. The addition of a helmet protects your head, but as with the kevlar it only reduces the damage caused by bullets and does not make you invulnerable. Don't rebuy armor if it's higher than 60. There's no difference between 100 armor and around 60ish armor. At the start of every round on a bomb defusal map, a random terrorist is given the C4 to plant. They may drop this, and it doesn't cost them anything, but they have been entrusted with it, and it is their duty (unless they drop it) to destroy the target with it. When playing a bomb defusal map, a bomb defusal kit is an invaluable thing to buy. You can defuse the bomb without one, but having one accelerates the process considerably, and once the bomb's been planted, there is precious little time to waste before it goes off. 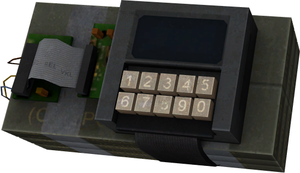 A Counter-Terrorist can defuse a bomb about ten seconds without a kit. With a kit, it takes five seconds. This page was last edited on 18 April 2014, at 00:43. This page has been accessed 321,253 times.